Share the post "Congratulations to Katie Whitford and Andrea Kuruda"
N.E.S. 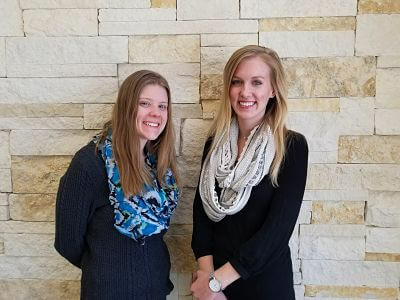 Inc. is pleased to announce that Katie Whitford and Andrea Kuruda have successfully completed the Landscape Architect Registration Examination (L.A.R.E.) during the December 2017 administration. The L.A.R.E. is a four-part fully computerized examination designed to determine whether applicants for landscape architectural licensure possess sufficient knowledge, skills, and abilities to provide services without endangering the health, safety and welfare of the public. Katie graduated from Kansas State University, with a Master of Landscape Architecture Degree from the College of Architecture, Planning and Design. During the 5-year program at K-State, Katie held an internship at N.E.S. in the summer of 2012, then returned to the firm after graduation in May 2013. Katie is responsible for project management including planning and design efforts, guiding clients through entitlement processes, and coordinating project teams. In her 5 years at N.E.S., Katie has worked on many exciting projects including Colorado College’s Tutt Library and East Campus Housing projects and the Gold Hill Mesa neighborhood development. She has now fully completed the L.A.R.E requirements and is a licensed landscape architect in the State of Colorado. Andrea first joined the N.E.S. team during the summer of 2015 as an intern. She then returned to N.E.S. in May of 2016 post college graduation. She has a Bachelor’s Degree in Landscape Architecture from Ball State University. In her time at N.E.S. she has introduced GIS to the team, which is now used in several major trail and master planning projects. She has also worked on several Colorado College projects including East Campus Housing and Academic Walk in which she has greatly enjoyed the construction detailing work.